It was a staple of my childhood and is absolutely delicious: savory and sausage-y in flavor but of much softer consistency. Sliced thin, it can be fried crisp; thick, it retains mushiness on the inside but crispy crunchiness on the outside. I completely understand your hesitation regarding “head parts”, something I myself plan to forget the moment this comment is done, but it’s delivered to the store in a form completely cooked and safe to eat right out of the package. Frying it up in the pan is an aesthetic act, not a safety measure. Neese’s (makers of the very best livermush, IMO) always have a table in the Kerr Scott Building at the state fair with free samples to taste. I highly recommend you pay them a visit for a little cube of cold livermush on a toothpick. It won’t be the total pan-fried experience, as frying it tends to sharpen the flavor and bring out the saltiness, but it will give you a no-commitment first impression. I have a friend who has grown up on livermush too since he has relatives in the mtns where it is a staple and they even have a festival. 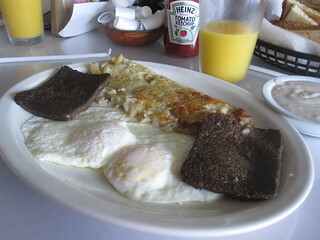 If you have ever had scrapple while up North say in the Philly area, that is what I’ve heard it is like. Let us know your takes on it, but get some suggestions how to serve it up. @ Robust McManlyPants, if you grew up on the stuff and ended up robust and manly, it must be good. I’ll give it a try soon. @ burgeoningfoodie, I sure hope livermush is better than liver & onions. Livermush makes me glad I’m a carnivore.I’ve been eating the savory meat since before I knew what it was.When I was a child all I knew was that, it was what I wanted for breakfast every day.Livermush was my first favorite food.There are many different ways to eat it here are just a few.My favorite is called egg and mush,brown 2 slices of L.M. add 2 over easy eggs and MUSH them together,spread on toast add cheese and a little mayo.My grandmother always ate a L.M. sandwich with slaw and mustard. Neese’s sausage of greensboro is definately the best, but there are a total of 5 liver mush manufacturers in North Carolina(the only state where it is mass produced). I have no clue what is wrong with the rest of the country oh-well it’s their loss. .
@Porky LeSwine, I use to hate chopped liver, but had some in NY and it made all the difference. It is pretty tasty to me now. Look forward to your livermush report. I had seen a few pieces on it and decided to buy the Neese’s brand, since I wasn’t going to be in Shelby in the near future ( where the stories were focused on their livermush festival). I cut it up and put it in my iron skillet to crisp up the outsides. It was not bad, but it was more mealie than I was expecting, somewhat like sausage and cornbread combined. It was dryer and leaner than sausage. Actually more like pone with a lot of grindings added; which I guess technically, it is. Tried it with both grape jelly and mustard. The jelly was a welcome sweet balance. Overall, it was not something I fell in love with. Although I appreciate it’s local heritage. But I think I will stick to a sausage biscuit with jelly. Being from texas, never heard of this! But I do love liver and will have to give it a try! Great links, will have to try to cook it up. Keep up the great work on the blog! I live in AZ but was born and raised North Carolina. I look forward to my next visit back to NC mostly to satisfy my craving for a livermush sandwich! Hey Ric, Just wanted to let you know – liver mush and liver pudding are definitely different. Liver mush is also different than Scrapple, and different than Liver & Onions too! If you like liver mush either cold or fried, you really need to try it grilled/smoked with a bit of barbecue sauce glazed onto it. GOOD STUFF!!! For another “different” pig product, try “SOUSE” (also called “souse-meat”). Once again, made with pig head parts and other stuff. I found liver mush in Food lion today, of course I bought a few lbs. In 1965, I lived in N.C. and kept liver mush in my fridge all the time. I love it as a sandwich or fried brown with eggs and toast. I also love souse, but I found out that you just can’t fry souce–it comes apart, but in a sandwich it is wonderful. I like things that are unusual and always have incl. mountain oysters. When I was a kid, my family had “Hog Killings” a few times every winter. I rember making Livermush in a cast iron washpot over a fire. Basically all we did was cook the liver and the head that had been cleaned up in water until everything was very tender, then remove the liver and head from the pot. Next we would grind the liver and any lean meat from the head and add the meat back to the pot. Spices were added next then corn meal. Cook til thick then pour into pans. Once it cooled is set-up into a firm loaf. I think threason the head was cooked was to extract flavor but more important the gelatin that helps it set up when cool. If you are ever in Kernersville, NC there is a small independent grocery named Musten & Crutchfeild the still makes it and it is awsome. They also have homemade Chicken Salad, Pimento Cheese, and hot dog chili. Damn, Cuz! Ya’ll got me straight trippin’! Here’s the photo of the livermush breakfast I enjoyed in Charlotte on Easter Sunday. Have you tried Neese’s SOUSE, SCRAPPLE or C-LOAF? I will never have the courage to try those three!! Souse is wonderful, but I’m not crazy about scrapple or C-loaf. My mother used to make souse when I was growing up. Still love it! Goetta is another meat that is great! Only available around the Cincinnati area.